Our New School for Social Research supporters help us continue our grand tradition of philosophically-informed, historically-rooted social science graduate education. From championing initiatives such as the Zolberg Institute on Migration and Mobility to giving to the Annual Fund where donations go directly to student fellowships, these generous supporters have made a substantial and direct impact on the experiences of our students. We are so grateful to this special community of alumni and friends for their investment in the future of our research, faculty, and students. At a time when the impact of our work is so critical to the larger world, we are forever grateful for the commitment of our of these generous individuals. The following fellowships are made possible through the generosity of donors. Most are awarded as Prize, Dean's, and University Fellowships and partial-tuition scholarships. Professor of Psychology Jeremy Safran (1952-2018) was a beloved teacher and mentor in the Clinical Psychology program at The New School for Social Research for 25 years. He was also an internationally renowned psychotherapist who was deeply respected for his groundbreaking work on psychoanalytic theory and practice. The Safran Fellowship provides additional funding for Clinical Psychology doctoral students. This scholarship is funded by the Overbrook Foundation to honor the long and influential association of Frank Altschul with The New School. The recipient is selected from scholarship applicants in the Department of Political Science. The award amount varies depending upon need and may provide tuition remission or a stipend for living expenses. Established in honor of Richard J. Bernstein, Vera List Professor of Philosophy and former dean of NSSR, this fellowship is awarded to a distinguished student in the Department of Philosophy. Gifts endowing the Bernstein Prize were contributed by members of the board of governors, university trustees, and alumni. Established in memory of Imogen Bunting, a brilliant student and beloved member of the New School community who passed away in 2006 at the age of 25, this fellowship is awarded annually to an outstanding graduate student who combines great scholarly promise with commitment to the ideals of justice and human rights. These fellowships are open to students pursuing doctoral degrees in economics, political science, philosophy, or historical studies. The fellowships pay tuition and provide a support stipend and are renewable for up to three years. They are awarded principally on the basis of academic merit. The Ernestine Bradley Fellowship Fund was established in 2006 to provide tuition support for graduate students at The New School for Social Research. The endowment for this fellowship comes partly from the gifts of individual supporters. The fellowships listed below were established in 1990 by university trustee Vera G. List in memory of nine children, ages two to 13, who perished in the Holocaust. Preference is given to students in the Philosophy Department. The Sara Borkshtein Fellowship, in honor of 13-year-old Sara Borkshtein, who was born in Lombzb, Poland, in 1930 and perished in Auschwitz in 1943. The Joseph Flattau Fellowship, in honor of nine-year-old Joseph Flattau, who was born in Poland in 1933 and perished in Treblinka in October 1942. The Tillie Jakir Fellowship, in honor of seven-year-old Tillie Jakir, who was born in Rudke, Poland, in 1935 and was killed in Lvov, Poland, in 1942. The Abraam Kardasr Fellowship. in honor of five-year-old Abraam Kardasr, who was born in Radchov, German Silesia, in 1938 and perished in Radsiechow, Poland, in 1943. The Genia Perelmuter Fellowship, in honor of two-year-old Genia Perelmuter, who was born in Krzemieniec, Poland, in 1939, and perished in Kremnitz, occupied USSR, in 1941. The Moshe Sarchon Fellowship, in honor of 13-year-old Moshe Sarchon, who was born in Rhodes, Greece, in 1931 and perished in Auschwitz on August 16, 1944. The Hedviga Schwartz Fellowship, in honor of three-year-old Hedviga Schwartz, who was born in Prague, occupied Czechoslovakia, in 1940 and perished in Auschwitz in 1943. The Sarah Sterner Fellowship, in honor of eight-year-old Sarah Sterner, who was born in Kraków, Poland, and perished in Treblinka. The Abraham Tabak Fellowship, in honor of nine-year-old Abraham Tabak, who was born in Romania in 1935 and perished in Auschwitz on May 30, 1944. This fellowship, established in memory of Deborah Mitchell, is awarded annually to an outstanding doctoral candidate in the Department of Political Science. Awarded by the Janey Program in Latin American Studies (established 1991 by the Rothenberg family), these grants support field research in Latin America. The New School Board of Trustees established this fellowship in 1990 in honor of Ira Katznelson, who was dean of the NSSR from 1983 to 1990. This fellowship is awarded annually to a student at The New School for Social Research in recognition of outstanding academic achievement. This fellowship, established with a gift from Alexander Melamid (PhD in Economics, 1951, The New School for Social Research) and Ilse Melamid, a former registrar of the school, provides funding for one Prize Fellowship and one dissertation fellowship recipient annually. Under the directorship of Simon Critchley, together with Philosophy faculty members, this fellowship is awarded by the Onassis Foundation to doctoral students working in the area of ancient Greek thought (especially drama, philosophy, political theory, history, and poetry). Also eligible are proposals that show the continuing relevance of ancient Greek thought for various areas in the history of philosophy and contemporary philosophy. 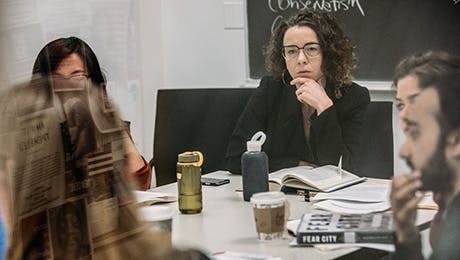 Established from the revocable trust of Jane Evans, the Jane Evans Fellowship provides support for Prize and Dean's Fellowships at The New School for Social Research. Dr. Evans, who died in 2004 at the age of 96, established the trust in 1996 with The New School as one of three beneficiaries. She was an advocate for human rights and world peace and a leader in efforts to aid displaced persons and other survivors of Nazi persecution. As chairman of the American Jewish Conference's Commission on Displaced Persons during World War II, she headed delegations to the United Nations Relief and Rehabilitation Administration. Established in 1995 with a gift from the late Vera List, a university life trustee, this fellowship honors Chiune Sugihara, who saved Jews from the Holocaust. The Sugihara Fellowship is open to students in all departments. These fellowships, established in memory of Alfred and Cecile Mundheim, provide support for Prize, Dean's, and dissertation fellowship recipients. The following partial tuition scholarships help outstanding students pursue full-time graduate study. Recipients must register for nine or more credits to receive these scholarships. This scholarship, established in memory of Aron Gurwitsch, is awarded annually to an outstanding student in the Department of Philosophy. Established in 2000 with a gift from Mrs. August Heckscher, this partial tuition scholarship is awarded annually to a student chosen from New School for Social Research scholarship recipients. This scholarship, established in memory of Reba Kirson Monness, an active member of the New School Associates, will be awarded annually to an outstanding student chosen from New School for Social Research scholarship recipients. This scholarship, established in memory of Reiner Schürmann, professor of philosophy at The New School for Social Research, is awarded annually to an outstanding student in the Department of Philosophy, chosen from scholarship recipients. Established in 2004 with a gift from Malcolm B. Smith, a longtime university trustee and member of the school's board of governors, and his wife, Betty, this scholarship is awarded annually to an outstanding student in the Department of Economics. These scholarships, established in memory of William B. Steerman, provide support for Prize, Dean's, and dissertation fellowship recipients. Established by the board of trustees of the university in honor of Dorothy Hirshon, chairman of the board from 1980 to 1985, and in recognition of her enduring commitment to the ideals of the University in Exile, the Hirshon Fellowship each year enables a student from a nation in which intellectual freedom is deemed to be threatened or abridged to study freely at The New School for Social Research. The fellowship provides support for one year of study. Established in 1991 by the Rothenberg family in connection with the Janey Program in Latin American Studies, these fellowships provide support for newly accepted and continuing graduate students from Latin American countries. This fellowship was endowed by the late Vera List in honor of Katarzyna Kalwinska, a Polish citizen, for the heroism she displayed during World War II by hiding Jewish concentration camp escapees from the Nazis. When asked why she chose to risk her life for others, Mrs. Kalwinska, a deeply religious Roman Catholic, said: "If God had wanted me to die because I saved Jews, I was ready to go on the cross like Jesus." Vera List established the fellowship, which is awarded annually to a student from Poland, so that Mrs. Kalwinska's humanitarian act would serve as a permanent inspiration to her countrymen and to all mankind. This fellowship was established to honor the people of the Netherlands and is awarded annually to a student residing in that nation. A panel of distinguished scholars from Dutch universities nominates recipients. The fellowship may be awarded within any department of The New School for Social Research. It is for a one-year term. Established in 1993 by the Leo Model Foundation and friends of Leo Model, this fellowship is awarded to a student from Israel. Established in 2003 with a gift from Robert Mundheim, a university trustee, and honoring his wife, Guna, a native of Latvia, this fellowship is awarded to a student from Latvia. The fellowship was established to encourage students from Latvia to study in the United States in the hope that they will use the education acquired at The New School for Social Research to contribute to the political and cultural development of Latvia. Established in memory of Raoul Wallenberg, a Swede who saved the lives of thousands of Hungarian Jews during World War II, this scholarship is awarded annually to a full-time New School student who is Swedish or of Swedish descent. The amount of the award may vary from year to year. The scholarship is awarded at the time of admission to The New School for Social Research. It provides partial support for one year of study. Established in 1991 by Dr. Ruth Westheimer in recognition of the financial assistance she received as a New School student in the 1950s, this partial tuition fellowship is awarded annually to a student at The New School for Social Research. Preference is given to those who, like Dr. Westheimer, have come to the United States seeking intellectual and personal freedom. Awarded each year to a New School student, this award is made possible through a gift to the Thanks to Scandinavia Organization by the late Vera List and others, to show appreciation to the Scandinavian people for their help in rescuing Jews during the Holocaust. Candidates apply in their home countries through the following foundations: the Denmark-Amerika Fondet, the League of Finnish-American Studies, the Sverige-Amerika Stiftelsen, and the Norge-Amerika Foreningen. Frieda Wunderlich Scholarships are awarded to qualified foreign students to assist them in their studies at The New School for Social Research. Students on F-1 or J-1 visas from any foreign country are eligible. Funds are limited and usually supplement other scholarship funds made available to the student.